Info Speaker of the House Catherine Hanaway was elected to serve in the General Assembly in 1998. At the end of her first term, Catherine was elected Minority Leader of the House. In 2003, she was elected by her colleagues to serve as the Speaker of the House. She is the first woman to ever hold either position. Speaker Hanaway has repeatedly stood against raising taxes and stood up for legislation that would bring more jobs to Missouri. She advocated legislation that improves the opportunities for Missouri small businesses, innovators and entrepreneurs to employ people. She understands the importance of employment, job security and the ability to provide for one’s family. These are issues that weigh on the minds of every Missourian, and they are issues Speaker Hanaway has worked in the House to address. When two-year-old Dominic James tragically lost his life in Springfield in 2002, all Missourians became aware of the need to protect the more than 12,000 children who are under the care of the state. Missouri's foster care system needed to be reformed. Speaker Hanaway worked tirelessly to pass a Foster Care Reform Bill that is named after Dominic James. This legislation will make great strides toward preventing child abuse and neglect. Speaker Hanaway also serves on the Board of Directors of the Foster and Adoptive Care Coalition. * Spirit of Enterprise Award- Missouri Chamber of Commerce. Speaker Hanaway has been active in politics and government since high school. In 1993, Speaker Hanaway began her professional career in government by working as a District Office Director for Senator Kit Bond and was the Executive Director of President George W. Bush’s campaign in Missouri in 2000. She earned her undergraduate degree in journalism from Creighton University and then went on to earn her law degree from Catholic University of America with an emphasis in securities law. She worked in the law firm of Peper, Martin, Jensen, Maichel & Hetlage, where she also specialized in securities law. Her experience in securities law gives her the expertise to be an exceptional enforcer of the laws that protect Missouri investors. This past legislative session, the Speaker worked for and succeeded in passing a bill that creates the crime of impeding a securities investigation by destroying documents and makes it a crime punishable by a $500,000 fine and/or 10 years in jail. Speaker Hanaway served as a member of the Election Committee in the House and supported the reforms that modernized Missouri’s election laws. She was also recently appointed to the federal Election Assistance Commission Board of Advisors, a group of 37 representatives from around the country who advise the federal Election Assistance Commission on the changes to elections being made as a result of the Help America Vote Act of 2002. She currently resides in Warson Woods with her husband Christopher, who works as a portfolio manager for A.G. Edwards, and their six-year-old daughter Lucy and two-year-old son Jack. Speaker Hanaway and her family belong to St. Genevieve Dubois Catholic Church. 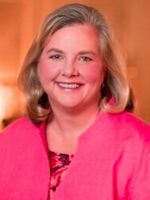 Catherine Hanaway is an experienced leader whose ability to work closely with the legislature puts her in a unique position to find real solutions to problems in the divisions of the Secretary of State’s office. She has the experience to lead the Secretary of State’s office further down the path of progress that Secretary Matt Blunt started. Catherine Hanaway is a wife and a mother who believes in family values, hard work and honesty and that the people of Missouri deserve no less.